Sharing educational ideas, lived classroom experiences, and inspiring others. Namaste! Our school has been working diligently on beginning to implement the Common Core State Standards as well as follow the best practices according to the Continuous Classroom Improvement system, the book Instruction for All Students by Paula Rutherford, and the Leader in Me book by Stephen R. Covey that showcases schools with the greatest success in turning around academics and student behavior. One of the ways we have done this is by working in our Professional Learning Communities (PLCs), or teams of grade level teachers, an instructional specialist, an administrator, and support SPED staff to conduct "backward planning". According to Paula Rutherford, the term backward planning means to begin with the end goal in mind because "just as we have a clear picture of that perfect vacation, car, wedding, or ad campaign, we need to have a clear picture of what it looks like when our students are competent with what we want them to know and be able to do" (Rutherford, 2008, p. 34). Therefore in one of our two weekly PLC meetings we plan our lessons together. A version of the template we have used to do this is below. 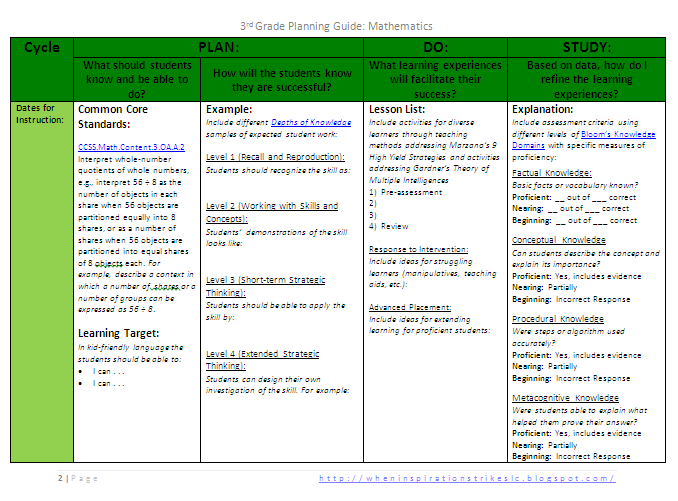 The best way to really understand the CCSS is to plan lessons collaboratively in this organized way!! The idea of working backwards to identify desired results, determine acceptable evidence, and planning learning experiences are also recommended in Understanding By Design by Carol Ann Tomlinson and Jay McTighe. 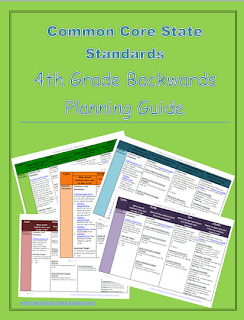 Read on to see how to organize these concepts! 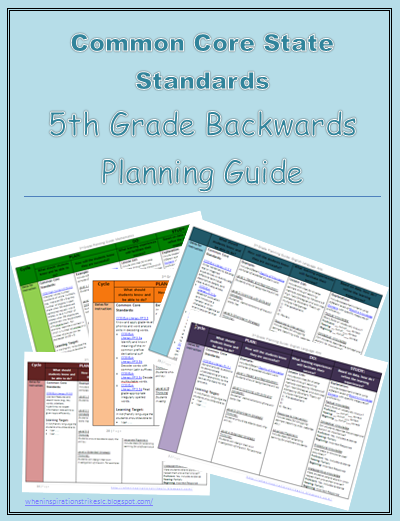 The templates are color coded (one color for math, many colors for the ELA standards by domain since many of those standards are taught at once and can get confusing). The 1st column includes the cycle, or days dedicated to teaching the standard. 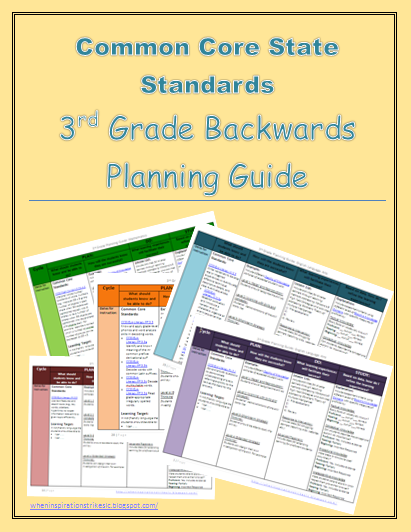 Dates are listed underneath so that everyone involved in the PLCs know the expectations for moving through the material at an appropriate agreed-upon pace. The next section is our Plan aligned to the CCI system (see PDSA Boards here) and the Stardards-Based Environment Planning Process ideology in the Rutherford book. Beginning with the Common Core Standards as the end we want to have in mind, they are listed first with a hyperlink to the original standards built in. 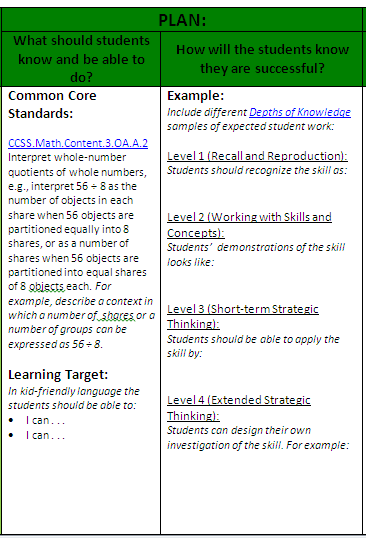 Covey recommends clear communication to the students so the learning targets are put into terms that students can use as their goals for learning. Awesome samples of these "I can" statements with examples of each standard can be found in Jason's Online Classroom store here. The Depths of Knowledge levels were added to our district pacing guides for this upcoming year in order to make sure our expectations of our students match the Rigor and Relevance demanded by the CCSS. A hyperlink to the D of K theory is embedded in the template for reference. The next column is our actual list of all of the lessons we could teach (some teams decide to teach every lesson in order for comparative data reasons, other teams pick and choose which activities would work best for their group of learners). 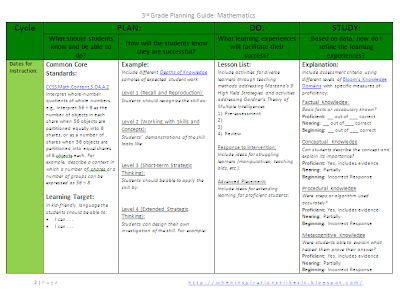 In order to engage students, differentiate, and give the most effective individualized lessons the template encourages activities based on Gardner's Theory of Multiple Intelligences and Marzano's High Yield Strategies and lists for helping struggling students or those needing a challenge. 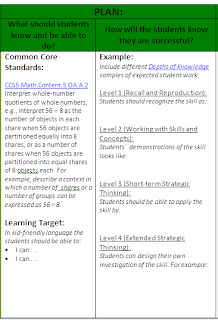 While it can be noted that our district has purchased curriculum aligned to the CCSS with lessons given, this list gives teachers freedom to also include supplemental materials that work well such as websites, videos, or games. The last column of the guide outlines how we agree to assess the students' knowledge and lesson effectiveness. Included is a link to the 4 updated Bloom's Knowledge Domains. These are just suggestions and can be deleted or modified by team need, but the expectations for proficiency are recommended for communication with students and their parents. Click HERE for 3rd Grade! Click HERE for 4th Grade! Click HERE for 5th Grade! Kinder is HERE! 1st grade HERE! 2nd grade HERE! Thanks for stopping by!! Back to School Bug Buddie!!! Thanks for viewing but please give credit where credit is due when you share. Simple theme. Theme images by mammuth. Powered by Blogger.